If you’re lucky enough to have never had a cavity, skip ahead! If you’re among the masses that have had at least one, you might be familiar with the metal fillings of the past. They are sometimes still used, but they’re very easy to spot and aren’t as sturdy as newer options. Today, a tooth-colored filling is available, in porcelain or composite resin, that blends right in with the surrounding tooth. You’d never know it’s there! These natural-looking, durable fillings are just one easy way to improve the appearance of your teeth. Our teeth become dull and stained over the years from food, drink, and personal habits like smoking. 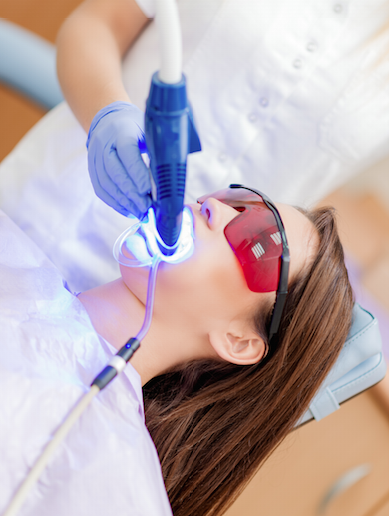 It’s no wonder that teeth whitening is one of the most popular forms of cosmetic dentistry! Everyone likes a brighter, whiter smile. There are many effective over-the-counter options such as whitening toothpaste and kits that may get the job done. But if you’re looking for a deeper clean and brighter white, however, you might want to ask your dentist. They should have even more effective whitening methods that can be performed at the office. They might not sound simple, but porcelain veneers are actually pretty easy to obtain and apply. It’s a thin piece of porcelain that the dentist attaches to the front of a tooth in order to alter tooth color or shape. Porcelain veneers are a great option for hiding gaps, chipped teeth and stained teeth. They’re comfortable, natural-looking, and can be completed in as little as 2 visits. The condition of your smile can mean the difference between hiding your mouth and beaming with confidence. With simple cosmetic dentistry, you can easily whiten, brighten, and shape your smile to be the best it can be. Ask your dentist what options you might have.